Sea green banarsi crinkle jamawar shirt has been embellished with red banarsi appliqued embroidered neckline. 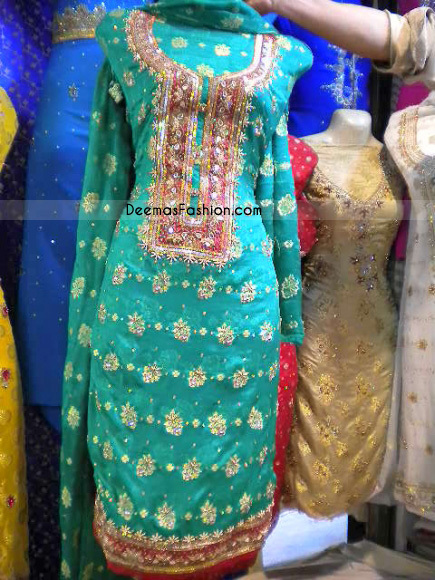 Embroidered work includes reeshan, dabka, kora, beads, kundun, stones etc. 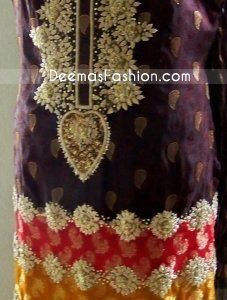 Red Banarsi applique implemented on hemline and appliqued embroidered border detailing before hem. Fully lined. Concealed back zip closure. Red Banarsi edges finished. Red banarsi jamawar shalwar fully elastic. Sea green crinkle jamawar dupatta finished with red banarsi piping on edges.